To celebrate National Pollinator Week running from June 18 to 24, 2018, this blog post will outline some native plants to plant as an alternative to non-native or invasive species you may have in your yard or garden. Planting native flowers will benefit the pollinators visiting your home and the greater Edmonton ecosystem as a whole, AND these native species are just as beautiful as their invasive lookalikes. Here are 7 substitutions you can make to improve pollinator habitat. You can find these seeds and more information about native plants from the Edmonton Native Plant Group. 1. Instead of Creeping Bellflower, plant Tall Lungwort. Creeping Bellflower is considered a noxious weed under the Alberta Weed Control Act, so it is not a good choice for a cute bell-shaped flower for your garden. Once established, it is very difficult to control, so it's better not to plant it at all. Not to worry! Tall Lungwort, sometimes called bluebells, looks very similar and will actually improve the local ecosystem and benefit pollinators. Bumblebees love Tall Lungwort and will try to crawl up inside of the narrow bell-shaped flowers. 2. Instead of Himalayan Balsam, plant Spotted Jewelweed. It’s no wonder the Himalayan Balsam plant was brought to North America - it’s such a nice-looking plant! However, it is a prohibited noxious weed because it is aggressively invasive, which means it out-competes many other species of plants that would naturally grow in the area. An aesthetically-similar, ecologically-beneficial alternative to Himalayan Balsam is the Spotted Jewelweed plant! It has been known to attract hummingbirds to your yard and has a very unique cone-shaped flower. 3. Instead of Purple Loosestrife, plant Meadow Blazingstar. Unfortunately, the beautiful Purple Loosestrife is a prohibited noxious weed in Alberta. However, there is a very similar looking flower called Meadow Blazingstar that is native to the Edmonton region and that is very beneficial for pollinators. Meadow Blazingstar is a great choice to plant instead because it will attract butterflies and bees to your garden, which will make your garden and the pollinators more successful. It’s a win-win! 4. 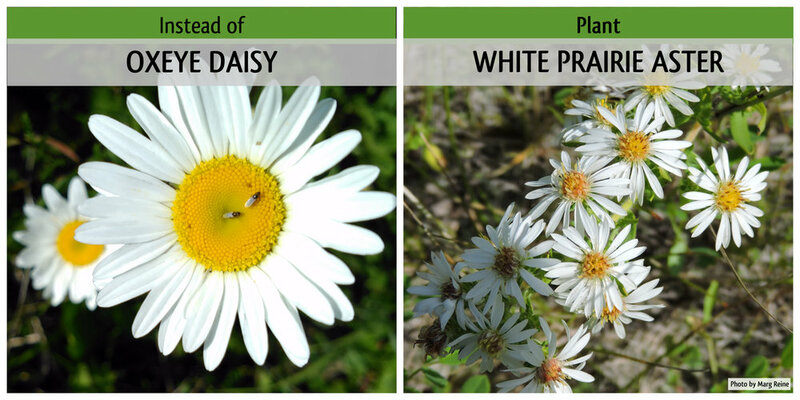 Instead of Oxeye Daisy, plant White Prairie Aster. Oxeye Daisy is classified as a noxious weed in Alberta. It was introduced from Europe as an ornamental garden plant, however, the ecological consequences of Oxeye Daisy weren’t known at the time. Oxeye Daisy can harbour crop diseases and choke out other native plants, so it isn’t a great plant to have in Edmonton’s ecosystems. Instead, you could plant Tufted White Prairie Aster, which has a similar appearance and blooms in late August to early September. It’s very helpful to have flowers that bloom at different times throughout the year so that pollinators have a food source even after most plants have bloomed already. 5. Instead of Dame’s Rocket, plant Common Yarrow. While it is a very attractive flower, Dame’s Rocket produces vast amounts of seeds that can cause this plant to spread quickly and take over entire areas, making it a noxious weed in Alberta. Dame’s Rocket was introduced to North America from Europe and SW Asia. An appealing, native species to substitute for Dame’s Rocket could be Common Yarrow! Common Yarrow has long, feathery leaves and blooms bunches of white flowers that are very beneficial to pollinators. Butterflies particularly enjoy Common Yarrow. 6. 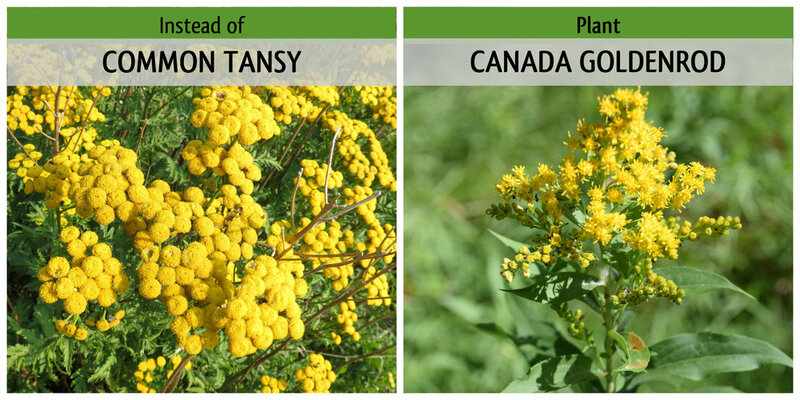 Instead of Common Tansy, plant Canada Goldenrod. The little yellow buttons of the Common Tansy may look nice, but they are not good for the local ecosystem. This woody-stemmed plant can be confused as an ornamental shrub, but is actually a noxious weed in Alberta. There is a toxic juice inside the stem of Common Tansy that can cause rashes, so if you are removing this weed from your yard or garden, be sure to wear gloves. A lovely yellow alternative might be Canada Goldenrod, a fairly tall and hardy plant that produces beautiful yellow flowers that pollinators enjoy. 7. 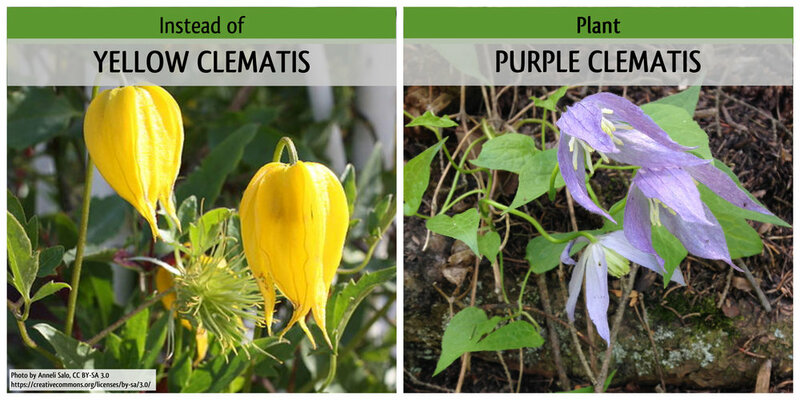 Instead of Yellow Clematis, plant Purple Clematis. Yellow Clematis originates in high mountain areas in China, India, and Japan. Because Yellow Clematis is a viny, climbing plant, it has the ability to grow around posts and other plants, smothering other plants as it does so. Its invasive properties deem it a noxious weed under the Alberta Weed Control Act. Its North American counterpart, Purple Clematis, looks almost identical but with a purple colouration and is a much better option to have in Edmonton yards and gardens. Where can you get native plants for your garden? Get in touch with the Edmonton Native Plant Group! They often have native plant seeds or seedlings available for purchase at local farmer's markets or special events. Blog Post Inspired by Keep Indianapolis Beautiful Inc.